Canara Bank PO Recruitment 2019: Good news, for all the candidates who are looking jobs in the Canara Bank for Probationary Officer Posts. Canara Bank is going to fill up the PO vacancies through Post Graduate Diploma in Banking and Finance (PGDBF). The candidates who are searching Bank Recruitment for Probationary Officer Posts can get all details from here and also complete the Application Process before the last date. In this article of Canara Bank PO Vacancy 2019 have all information related to Application Form, Released Date of Application Form and Last Date, numbers of vacancies, Eligibility Criteria, Age limit, Away of apply, Application Fee, Educational Qualification etc. 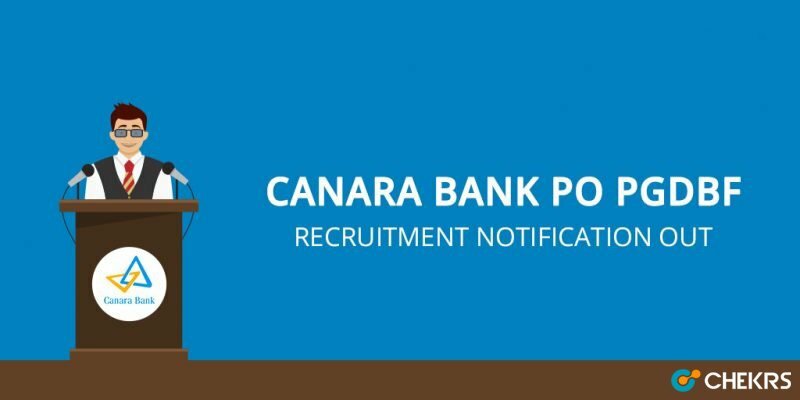 Latest Update: Canara Bank is going to release Canara Bank PO Recruitment 2019 Notification to fill up the various vacancies. Interested candidates can fill the application form through the official website on or before the last date. The Canara Bank has been released Canara Bank PO Recruitment 2019 Notification on the official website to fill up the vacant posts. Canara Bank, a leading Public Sector Bank , invites Canara Bank PO Online Application, from the eligible candidates to apply for admissions to the specially designed one year training course leading to Post Graduate Diploma in Banking and Finance (PGDBF) either through Manipal Global Education Services Pvt Ltd., Bengaluru or NITTE Education International Pvt Ltd.,Mangaluru, which are recognised by UGC. Recently Canara bank is released the Probationary Officer vacancies. Interested and eligible candidates are invited to complete the online application process from before the last date. Candidates should carefully pay the application fee. Applicants who are searching Government Jobs can check the compete for details from here. Minimum 20 years–Maximum 30 years i.e. a candidate must have been born not earlier than 2nd Januaury1988 and not later than 1st Januaury1998 (both days inclusive). The Basic Pay Scale is JMGS-1: Rs. 23700–980/7–30560–1145/2–32850–1310/7–42020. The candidates can apply for the application form on or before the last date. Candidates are required to visit the Canara Bank website (www.canarabank.com). Click on “Career Button” and New window will be open. Again click on Recruitment Link. Click on the Recruitment of Probationary Officers in JMGS-I on completion of specially designed PGDBF Course link. Read the notification carefully and get information related to Recruitment. The link for registration of application will be open in the website on the dates indicated at the top of this advertisement. All applicants should have a valid personal e-mail ID. The registered e-mail id should be kept functional till completion of this selection process. All the communications will be sent to the candidates to this e-mail ID only. Fill the Application Form, upload the Photograph, Signature and other required documents. Candidates can take the print of application form after submitting it for the future uses. For more information, we can update soon about Canara Bank PO Recruitment 2019 and are providing the latest update related to upcoming Recruitment on our website that is www.jobs.chekrs.com. If you have any query about Canara Bank Recruitment that writes on comment box that is given below and takes review or feedback.